IN SPACE, NO ONE CAN HEAR YOU READ! "Doctor What" is the thirty-second comic issue, which was released 25 July, 2007 in the US and 10 January, 2008 in the UK. In the beginning of the comic, Professor Farnsworth announces that he has created the world's greatest porta-potty. When it flushes, it teleports you to a random place in space and time, and when you flush the second time, it returns you to the Planet Express building. Whilst Farnsworth is being interviewed by Straight Poop, Zoidberg goes into the porta-potty to poke around. Zoidberg ends up breaking the switch that teleports the porta-potty. The operating manual tells the team that every flush they make will take them to a random time and place. Getting anxious, Fry flushes the loo. The porta-potty takes them to a futuristic-medieval time. A man walks over to them and tells them a great war is going on. The gang investigate, only to find that the war was an online role-playing game. Zoidberg accidentally trips over the cable, turning the computers off. The geeks remember that they had a life before the game and thank Zoidberg. They also give him a medal. The gang visits two other worlds where Zoidberg accidentally saves everyone. By this time he has three medals. Bender flirts with the operating manual in the porta-potty and gets the code to go home. Not wanting to go back to being worthless, Zoidberg changes the code and it take the gang to Earth - 25 years in the future. A robot walks over to Fry and knocks him out. A mutant then knocks out Leela. the rest of the gang are also knocked out. They are then awoken and meet their leader - Sir Leelan von Fry-bot. Leelan tells them he is Fry and Leela's son. To prevent them stopping him in the past, he sentences them to a life-long time-out. 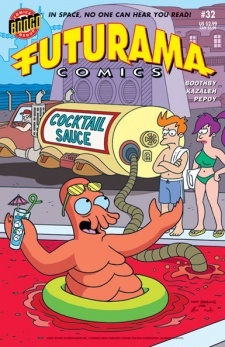 As Fry, Leela and Bender are blood relatives to him and don't want to kill him it is up to Zoidberg to stop him. Giving Bender his medals as a bribe, Zoidberg escapes and meets an older version of him. He reveals that after he returned without the others, he felt too guilty to tell them that he left the others in the future, so he says that they were killed. Farnsworth missed Fry and Leela so much, he created a mixed clone of Leela and Fry. A robot nanny with Bender's memories copied into it looked after the baby, singing songs about enslaving all humans. The songs sunk in to the baby, and when he was older, he enslaved all of the humans. Using old Zoidberg's shell as a decoy, Zoidbeg sneaks up behind Leelan and strangles him. Leelan is then arrested. Fry, Leela and Bender say that Zoidberg is a hero and as soon as they get back, they were going to celebrate. However when they return Farnsworth sprays the gang with memory loss spray so they don't cheat at the lottery. When Bender finds the medals for Zoidberg he crosses out Zoidberg's name and writes his name there instead. The comic's premise is to an extent a parody of Doctor Who, complete with TARDIS, Daleks and K-9. They visit a parody of the film clip for The Beatles' "Yellow Submarine". World of Battle-craft is named after the online role-playing game World of Warcraft. Cubert is drawn off model, with curly hair. This page was last edited on 10 January 2014, at 22:56.